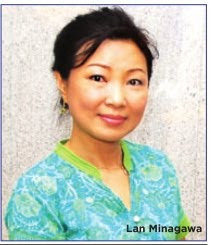 Lan Minagawa talks about Ikebana to Indian Express! All pictures from the original article. 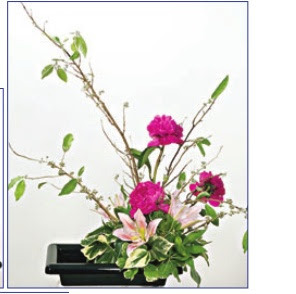 THE Japanese art of flower arrangeC ment is catching up, with a lot of Chennaiites. Many women are learning this beautiful art form. This is not a simple flower arrangement in a vase, it's more about a form in which nature and humanity are brought on the same platform. 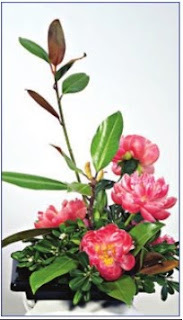 Shape and form are important while arranging the flowers to bring out the essence of the arrangement. Stems and leaves are necessary to give the organic feel. "I didn't learn from a school, I learnt ikebana from books," says Lan Minagawa, the wife of the Japanese Consul General in Chennai. She shares that General in Chennai. She shares that she loves "Making ikebanas at home, when expecting guests." Along with flowers from her garden, Lan gets her flowers from Amethyst as well. She prefers the Moribana form and uses kenzan or pin holders. "In the summer, my arrangements are such that the water used, can be seen. It gives a cooling effect," she says. 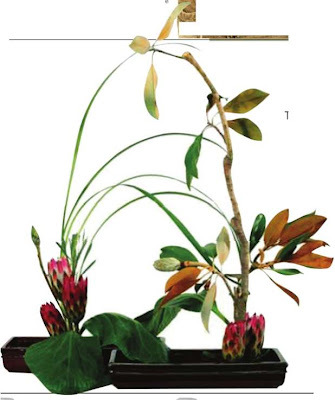 Along with the flowers and stalks, water, pin holders and stones are required to make the ikebana. After the team went off to Delhi and returned excited, happy and with renewed creativity, things have been quiet around the Sogetsu Chennai team. It was time for the September workshop to be hosted by Seethalakshmi, and what a treat it was! A gracious hostess with a lovely home, an innovative demonstration by Vaishali, gorgeous freestyle arrangements by others (except me! ), and of course a super lunch!! Unfortunately, (ok dont yell), I forgot my trusted digicam, and had to rely on my phone cam. From next time, will somebody remind me the previous day to take my camera please?! So, my apologies to Molly and Chitra. Their other arrangements I have not photographed. As we entered Seetha's home, after negotiating the various "No Entry" and "No Right Turn" boards along the way, we immediately spied lovely granite vases as well as beautiful arrangements. Then it was time for Vaishali to begin. Was she nervous? I dont think so, or if she was, she hid it well. It was IIT Zindabad, as the campus gave her unusual material, berries and vine. Her first arrangement was a shallow, almost like a plate, ceramic vase, in which she used spider lily leaves, in a circular, horizontal fashion, to provide bold strokes moving laterally. balance was provided by an Asia Lily (yellow) going vertical. Unfortunately, I dont have a good picture of this, and so we have to wait for Seetha's pictures to reach me. Then, Vaishali set to work on her steel containers, purchased at Delhi. The pedalanthus leaves had lovely flowing lines, and the jerberas provided the colour. The pictures do not do justice to the arrangement - I should have placed them on a plain background, and then taken the picture. Sorry, Vaishali! Next time! She finished with this innovative use of discarded "yelaneer"!! The holes in the coconut were used as receptacles for material, and it was a no-kenzan arrangement, with the white and green Anthuriums complementing the composition beautifully! Molly had brought her mother's antique cake tin to experiment with. You can see her working on it, in the background of the picture below, though I do not have a picture of the arrangement itself. That was most enjoyable Vaishali! Thank You. Congratulations to Meenu on her teacher's certificate, and Shoba for getting her first degree! And thank you Seetha for the fabulous lunch!! Mmmm...I am still dreaming of those potato chips! Next workshop date set for Oct 12th. Be there, all! And yours truly also better do some Ikebana next time!